The Patriarch of Venice (Latin: Patriarcha Venetiarum, Italian: Patriarca di Venezia) is the ordinary bishop of the Roman Catholic Archdiocese of Venice. The bishop is one of the few Patriarchs in the Latin Rite of the Roman Catholic Church (currently five Latin sees, including the Diocese of Rome itself, are accorded the title of Patriarchate, together with Lisbon, the East Indies and Jerusalem). Currently, the only advantage of this purely formal title is the bishop's place of honour in papal processions. The diocese of Venice was created in 774 as suffragan of the Patriarchate of Grado. It was only in 1457 that, in consideration of the political influence of the city, its bishops were accorded the title of patriarch by the Pope. 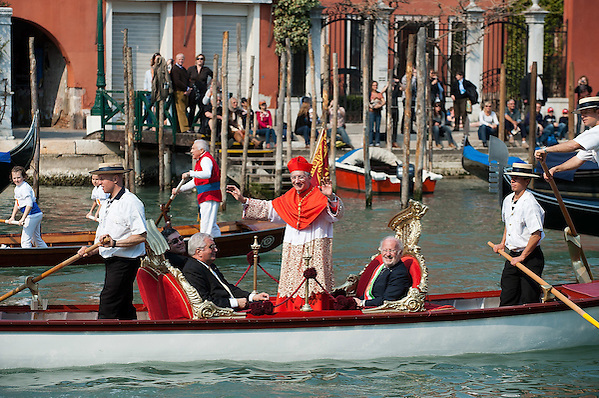 By tradition, the Patriarch of Venice is created a cardinal at the consistory following his appointment, although the Pope is not bound by law to do so. A large number of the prelates holding this office have been elected Pope. Three of these were in the 20th century alone: Pope Pius X (1903), Pope John XXIII (1958) and Pope John Paul I (1978).